So I had planned to take these pictures outside the other day, but with the sun setting earlier and earlier each day, it didn't end up happening. 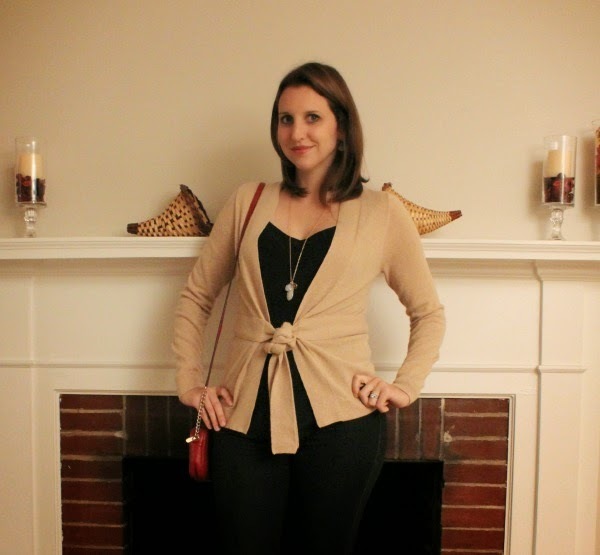 The temperature was very mild on Friday night, so this new cashmere sweater I picked up was enough for dinner outside. I went with black basics underneath - jeans and a silk tank - with gray boots. I got this oatmeal J. Crew cashmere cardigan from a consignment shop in town. I sometimes have a tough time shopping in consignment shops because they can be a little overloaded. I have to be in the right frame of mind and have enough time to really sort through to find gems. Luckily this sweater was sitting in the front of the new arrivals rack and it was just my size. 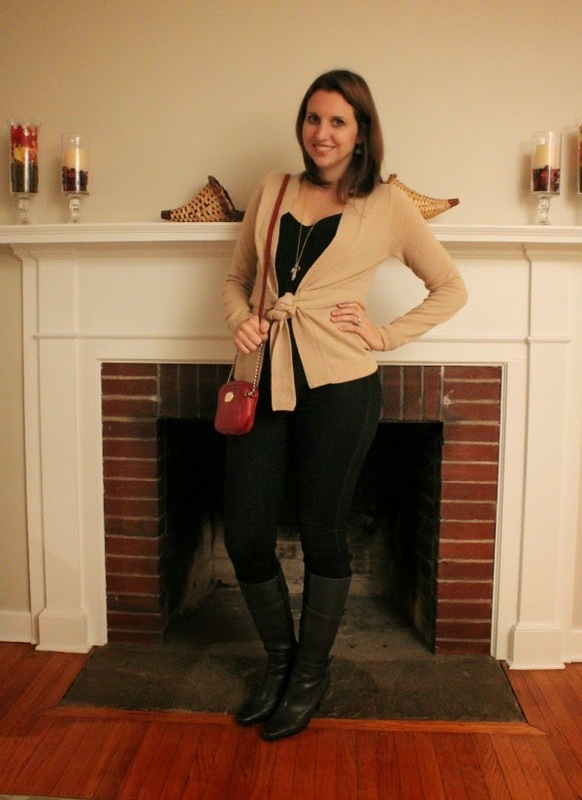 Can't beat a 100% cashmere wrap sweater for under $35! Almost forgot to mention my new haircut! I went with a darker shade and a long bob for the fall. It's a little shorter in the back, which you can see in the profile shot below. I am loving the change so far! It's definitely the shortest it's been for a few years. Linking up with Rhea Et Cetera, More Pieces of Me & On the Daily Express, Cha Cha & Pink Sole, DC in Style, Still Being Molly & Lipgloss & Crayons, I Have a Degree in This & Join the Gossip, Claire Justine OXOX, Fizz and Frosting. Love the haircut, and that bag is such a great classic for fall! Great look! I love neutral looks like this!